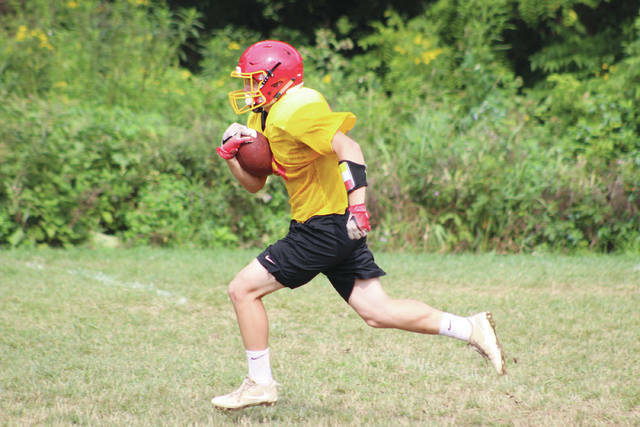 Big Walnut’s Jimmy Gianessi finds some running room during a practice earlier this summer. BW coach Joe Weaver talks to his offense during a practice earlier this summer. Aug. 24 — Vs. Johnstown, 7 p.m.
Aug. 31 — Vs. Buckeye Valley, 7 p.m.
Sept. 7 — Vs. Dublin Scioto, 7 p.m.
Sept. 14 — @ Olentangy Orange, 7 p.m.
Sept. 21 — Vs. Marysville, 7 p.m.
Sept. 28 — Vs. Newark, 7 p.m.
Oct. 5 — @ Franklin Heights, 7 p.m.
Oct. 12 — @ New Albany, 7 p.m.
Oct. 19 — Vs. Groveport, 7 p.m.
Oct. 26 — @ Canal Winchester, 7 p.m.
A little leadership can go a long way … just look at how far it took the Big Walnut football team last season. In case you need a refresher, the Golden Eagles lost all five of their non-conference games. Losing all-everything linebacker and running back Abe Myers — currently a preferred walk-on at Ohio State — in the fourth game certainly didn’t help matters, either. Things weren’t looking good for BW. Instead of letting the season slip away, though, the Eagles went on to win each of their first four league games and nab a share of the OCC-Capital crown. How? BW coach Joe Weaver said great leadership was a key piece to the run. Hopefully, he said, some of that rubbed off on this year’s group. “We’ve got new faces, no question about it … and that’s OK,” he said. “They were around and they were a part of last year as well … they grew from it, too. You take bits and pieces from each team and these guys saw what strong leadership can do. On the offensive side of the ball, guys looking to step into more of a leadership role include seniors Jimmy Gianessi, Andy VanHouten and Nathan Lawyer. All three saw time in the backfield last fall. Juniors Tyler Crotinger and Mitchell Embaugh could also collect some carries, Weaver said. The rest of the skill players have some experience as well, with receivers Sam Elliott, Dante Chuuom and tight end Craig Norman all returning to the fold. Seniors Jakob Daniels and Nathan Montgomery and sophomores Zach Barnecut and Brady Hershberger will look to add depth outside. The line is a bit thin, at least from an experience standpoint, but BW will have senior Wes Coey returning to his starting tackle spot. Beyond that, Weaver said a crew including seniors Josh Hageman, C.J. Rockwell and Aiden Rond, juniors Max Lenz, Henry Sydnor and Quintin Humphries and sophomores Kelton Thompson and Bryce Wardlow will look to fill the holes left by a handful of starters lost to graduation. As for the guy (or guys) running the show behind that line, junior Lucas Ronk and sophomore Jagger Barnett are competing for time at quarterback. Defensively, Weaver said Ronk, Humphries, Gianessi, Lawyer, Crotinger, Coey, Rockwell, Hageman, Caden and Holden Williams, Ryan Coletta, Ryne Conley, Gavin Mckelvey, A.J. Leasure and Pavel Beadle are expected to make plays as linemen and linebackers. 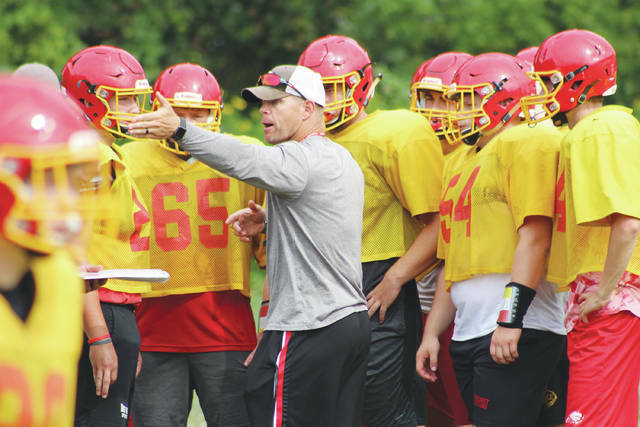 Elliott, Chuuom, Montgomery, Bryce Crotinger, Mitchell Truax and Jacob Ronk will be among the players Big Walnut will count on to roam the secondary and make plays on the ball. Of course, you can’t make plays on the ball unless you get to the ball — something Weaver said the Eagles are focusing on. “How good we are on defense is going to be predicated on how well we run to the ball,” the coach said. “We can’t rely on blitzes … we have to rely on our fundamentals and technique to get us to the ball in a hurry. Big Walnut opens the season with three straight home games against Johnstown, Buckeye Valley and Dublin Scioto. The first and third are the same as last year. BV, though, is a new opponent this season.